Explore Mallorca's spectacular and unspoilt Serra De Tramuntana from Port de Soller to the 18th century town of Port de Pollenca. Walk along dramtic coastal pathways and historic merchant routes to traditional villages and beautiful lakes. Trip starts in Port de Soller, a pretty harbour town surrounded by the Tramuntana Mountains and our base for the next three nights. Early this morning we take a public bus the short distance to Deia, a beautiful village and once the home of poet Robert Graves. We wander through Deia with its stone houses stacked one above the other, and continue through the stone-built terraces of olive trees, to the tiny Cala de Deia, a rocky fishing cove. We follow this dramatic coastline north, through Llucalcari village and back to Port de Soller. Today's 11 kilometre linear walk is expected to take around five hours with 300 metres of ascent and 540 metres of descent. After breakfast we travel by taxis or minibus to the attractive rural town of Valldemossa. From here we take a circular walk along the stone path known as the Archduke's Trail, part of which was laid by Archduke Ludwig Salvador of Austria who owned the local estate in the 19th century. The path offers some insight into rural life, including lime kilns and charcoal stoves , as well as stunning coastal views. We return to Port de Soller from Valldemossa by taxi or minibus. Today's 11 kilometre walk is expected to take around three-and-a-half hours with 400 metres of descent. This morning we take the historic tram out to the town of Soller, just inland. Here we start our walk to Cuber Lake in the heart of the Tramuntana Range, an area rich with bird life. We walk via the village of Biniaraitx and cross the Coll d'Ofre pass (890m) en route to the lake, which lies in the shadow of the highest peak on the island, Puig Major (1443m). We then travel by minibus or taxi to the remote valley where Lluc Monastery has quietly existed since the 13th century, and where we will spent the night. The 'Monestir de Nostra Senyora de Lluc' is an historic sanctuary and place of pilgrimage, and still takes in visitors. We can eat in the atmospheric wooden-beamed hall, formerly the monks' dining room. The impressive Basilica is well worth visiting, and the peaceful and beautiful setting is best appreciated by a short walk to the Mysteries of the Rosary which will take you up to the crucifix at the peak of a nearby hill. Look out for granite stations, some of which were worked on by Gaudi himself but never completed due to his sudden and unexplained departure from the island. Today's 12 kilometre walk is expected to take around four-and-a-half hours with 850 metres of ascent and 150 metres of descent. To note that today's walk is point to point and there is not the option to be picked up along the way. Following one of the oldest pilgrimage trails on the island, we start our walk from Lluc passing through shady woodland, with the imposing north face of Tomir looming over us. As the path starts to descend, we get our first stunning view of Pollenca, built a few kilometres from the sea to protect against pirate attacks, and the port beyond. Entering denser woodland, the steep, scree covered slopes of Tomir tower even nearer as we continue our descent. Finally we join a small lane going past pretty cottages and fields of almond and orange trees, a serene farming landscape with the mountain range rising majestically behind. As we approach the main road into Pollenca we meet our minibus and continue to Port de Pollenca by bus. For those wishing to explore the ancient narrow streets and impressive plaza of Pollenca there is the option to be dropped off en route, making their own way to Port de Pollenca. Today's 12.5 kilometre walk is expected to take around four-and-a-half hours with 200 metres of ascent and 600 metres of descent. Today is free to relax, swim, walk or take one of a number of excursions in and around the Peninsula de Formentor. For those who wish to explore on foot a little more, it is possible to walk to Cala Boquer. The route affords superb views into the bays and winds among the palms and pine trees. The peninsula is also popular amongst ornithologists due to its resident birdlife and in April to October it's location on the migratory routes. The largest marshland in the Mediterranean is located at the Natural Park of S'Albufera, just south of Port d'Alcudia and is criss-crossed by paths linking bridges and hides from which to view the varied birdlife. Alternatively you may choose to visit Mallorca's capital Palma. Palma dates back to pre-Roman times, the architecture shaped by the ebb and flow of trade. For many people the highlight is the warren of narrow streets, reminders of its prosperity before Spanish trade shifted to the New World. This morning we travel by taxi to the Victoria Peninsula, on the north coast of the island. Starting from Chapel Ermita de la Victoria we walk to Talaia peak (451m), with an optional detour to Penya Roja viewpoint before descending to S'lllot beach. The route takes us along a wide forested road and single trails. There will be time for a swim and rest before making our way back to Port de Pollenca by public bus. On the return journy there will be an opportunity to be dropped off at Alcudia, a medieval town with a popular market, and make your own way back to the hotel by public bus (approx. 11kms). Today's 13 kilometre walk is expected to take around five hours with 360 metres of ascent and 400 metres of descent. The optional walk to the viewpoint is not suitable for vertigo sufferers. Trip ends in Port de Pollenca. Accordingly, you should allow at least €5 for tipping. 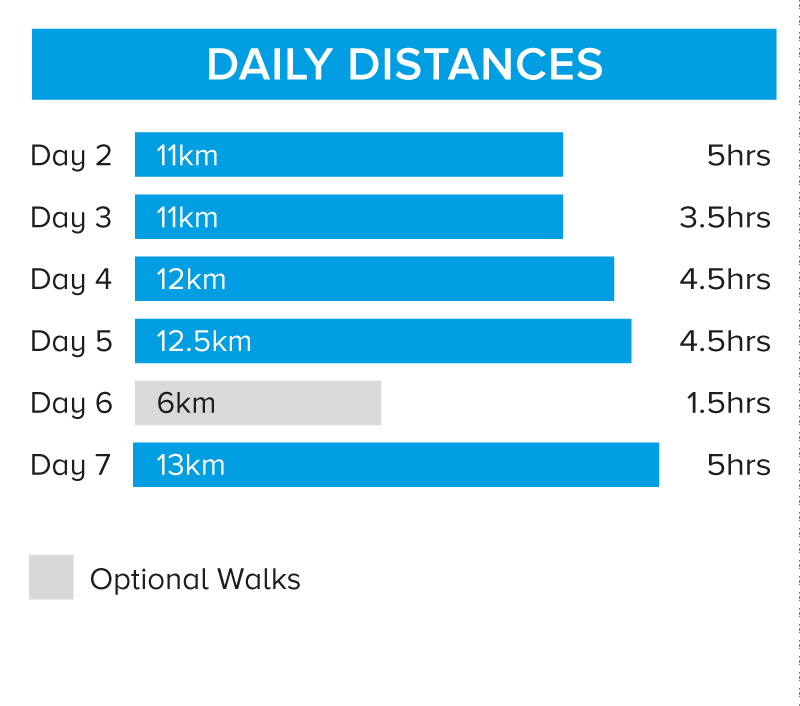 Walks on 5 days for between 3.5 to 5 hours, with an additional optional walk on day 6. Follow forested roads, unmade roads and dry stone paths along the Archduke's Trail.